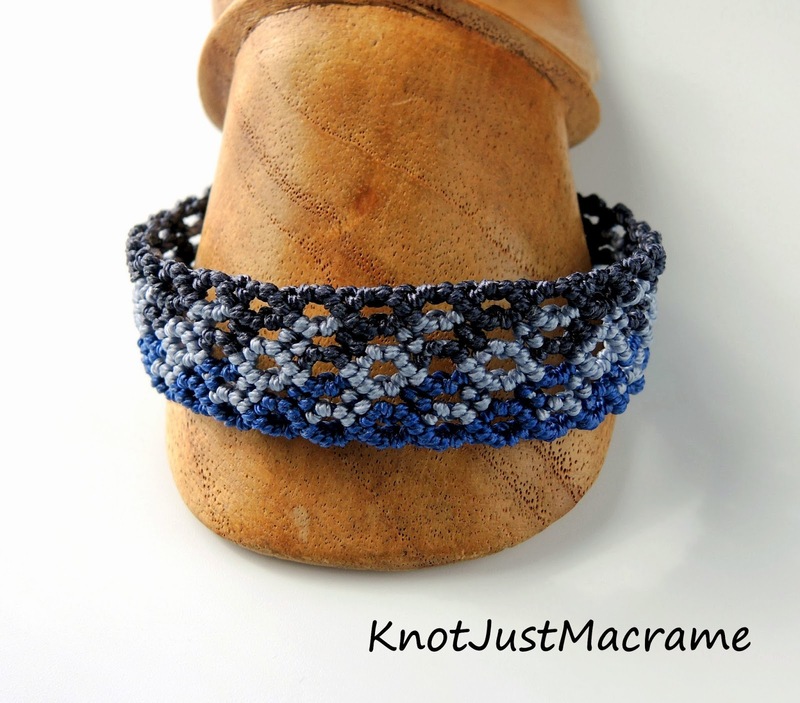 It's been a long time coming, folks, but I finally finished a tutorial for a version of the Curves micro macrame bracelet! 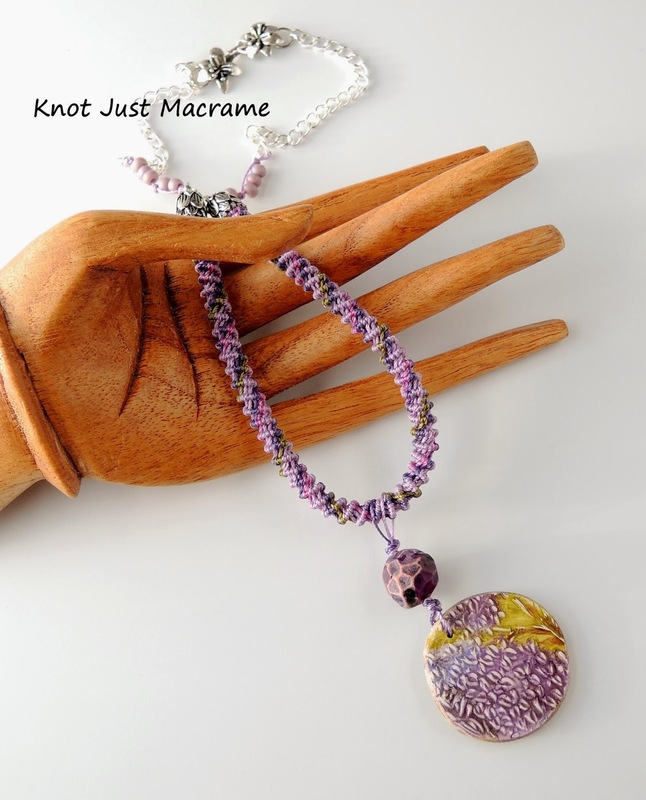 This one is knotted in Tex 400 cord for a nice beefy bracelet. 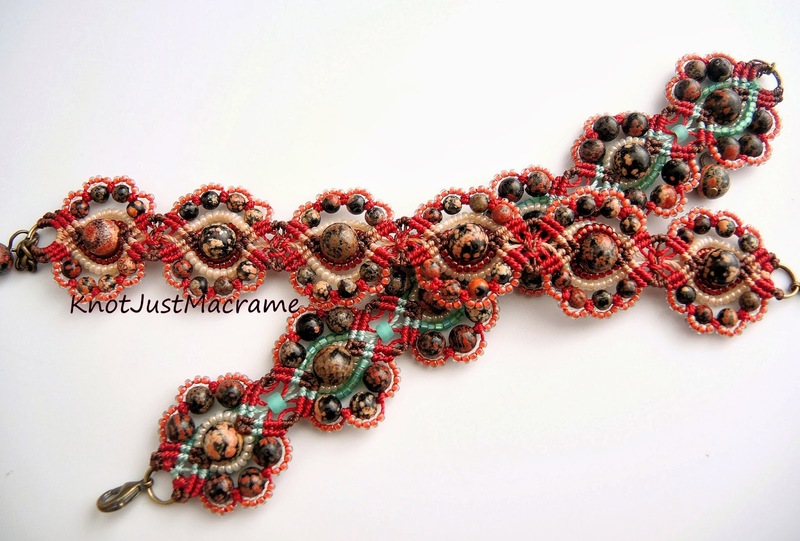 The whole bracelet uses only ONE macrame knot. Yes, really - only double half hitch knots (which you can learn how to make here). You make them backwards and forwards and every-other-wards, but it's still only ONE knot. I finished off this design with some clamp ribbon ends for a nice, neat look and added a simple toggle clasp. A lobster clasp also works nicely. This is an example of one of the photographs from the tutorial. I took a million photos... okay, that might be a bit of an exaggeration, but I did include about 70 photographs in 24 pages of step by step instructions. I'd probably rate this pattern as sort of middle-of-the-road as far as difficulty. It's not hard (only ONE knot, remember?) but you do have to keep track of the cords that are trying to go off in one direction or another. 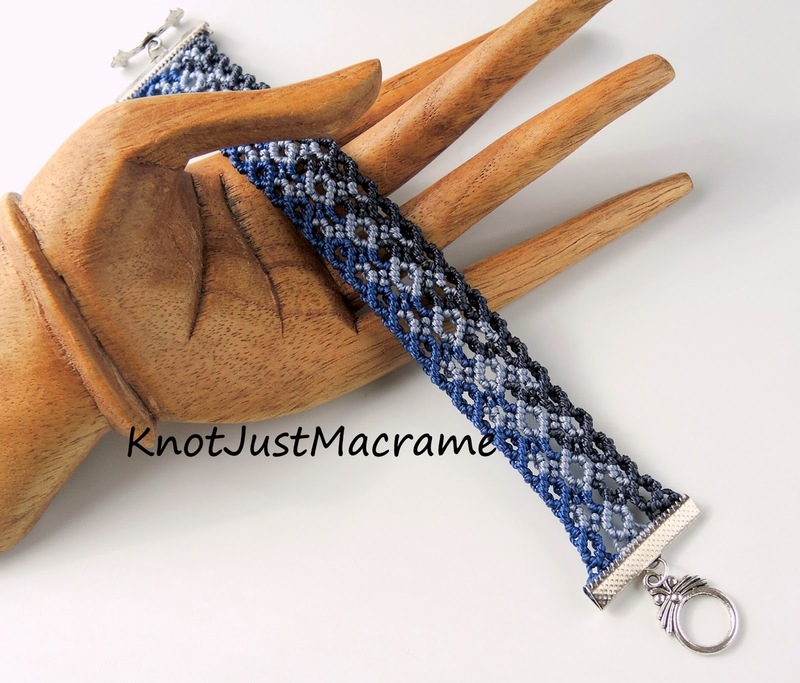 If you are comfortable with the double half hitch knot, you're probably ready for this one. 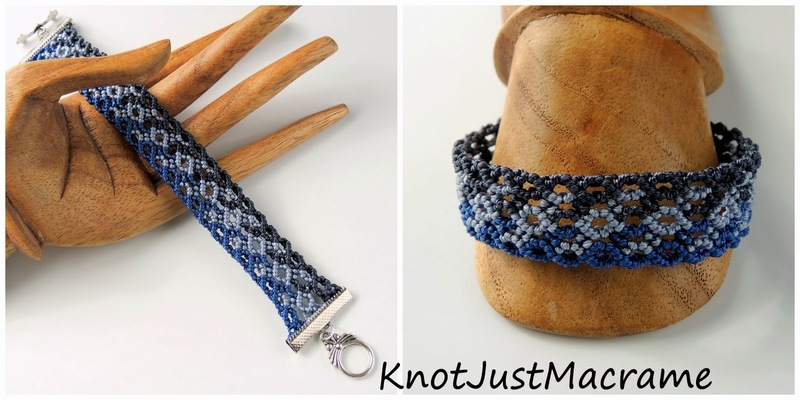 You'll find this new micro macrame bracelet tutorial in my Etsy shop here. 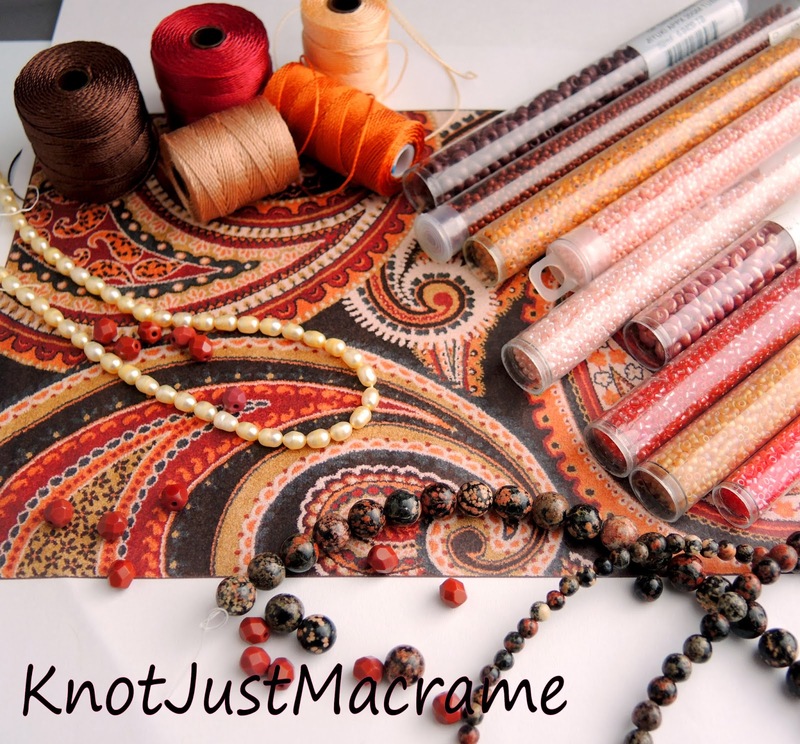 Happy knotting!! Once upon a time in the farthest reaches of a a faraway land, there lived a dragon. She was a beautiful, wild creature who hunted in the craggy mountains and made her home in a rocky cave. Her graceful body was covered coppery scales which perfectly camouflaged her sinuous curves and sweeping wings. But she was far from dull, this coppery dragon, for when the sunlight caught her body just right, she shone with golden hues and glints of pink and blue and green. This dragon thought hers was the perfect life. The perfect setting, the perfect coloring - everything a dragon should be. One day this dragon decided to venture further into the kingdom and what she found amazed her. Everywhere she looked, she found dragons in magnificent colors, with brightly colored scales and feathered wings. And each of these new dragons thought it was the perfect dragon. Perfect in every way. The first dragon was so dazzled by the beauty of the others that she began to doubt herself. She forgot what a fierce and powerful hunter she was, how cunning and smart and perfectly suited for her life. She compared herself and felt inferior. And the moral of this dragon's tale? We must never forget that each and every one of us is perfect - just exactly the way we are. Perceived flaws and all. We are all different and we are all perfect. If you look for the flaws, you will find them. And if you search for the strength and beauty, you will find that instead.